Sometimes collectibles turn up in really odd places, like your kitchen cabinets and drawers for instance. 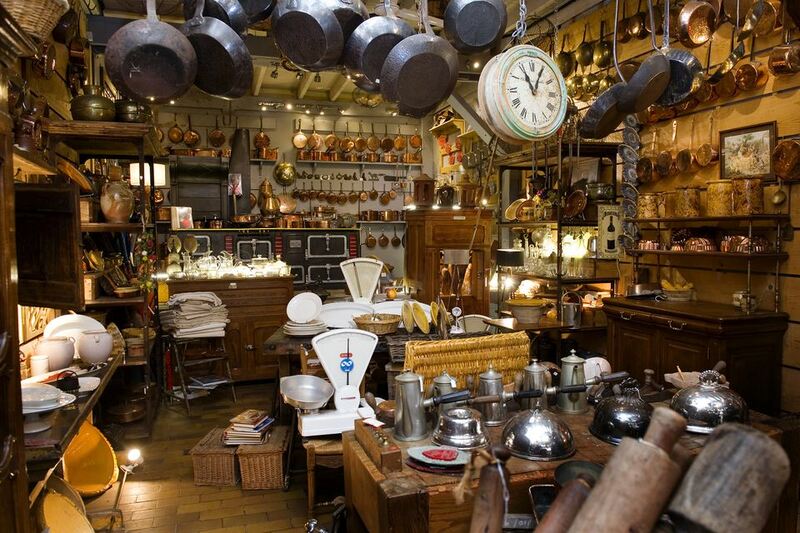 Vintage kitchen tools and gadgets are collectible and can be worth quite a bit of cash if offered to the right buyer. If find items that are appealing in a vintage way, it might pay to check them out a little further before tossing them in the garage sale box. Which Kitchen Gadgets are Collectible? If your gizmo is used in the kitchen and made in a style that's not readily sold in retail stores today, it's likely considered collectible. Collectors are interested in items such as potato mashers, eggbeaters, ice cream scoops, melon ballers, olive forks, and tin cookie cutters, just for a start. For some. simply buying them isn't enough. They want to display them, discuss them, and amass hordes of their favorite items. What Makes a Kitchen Item Valuable? Unusual features, shapes, and styles of ordinary kitchen items make them more valuable. For instance, something as mundane as an ice cream scoop can be worth hundreds of dollars if it’s made by a well-known manufacturer like Gilchrist, and it has an unusual shape. If the condition is excellent to mint, as in rarely if ever used, that adds on even more collectible value. These items were sold be used in kitchens frequently, and the old ones were made to last. It’s unusual to find one that doesn’t show some wear. What a handle is made of can also have an impact on how much an old kitchen item will sell for. Some folks look for thingamajigs with wooden handles painted red or green. These were very popular in the 1930s and 1940s. Potato mashers with green handles and metal implements go for about $10-15 apiece, but that’s more than what most people would think they’re worth. Even a metal tea strainer with a red handle can bring $5-10 in some cases. Just be sure not to wash those items with a painted handle in the dishwasher or you risk ruining removing all the color. Bakelite (a type of durable plastic popular in the 1930s) devotees scour flea markets and antique shops for various utensils with handles in the usual colors of red, butterscotch yellow, or apple green. For instance, a set of butter knives with Bakelite handles in various bright colors might sell in the $40-50 range. A set of matching lobster forks with brown marbled handles, or another unusual type of implement, would bring in a similar amount, while a salad serving set with yellow handles might fetch $20-25 or so. Single items with Bakelite handles, like a meat fork or a fancy cake server, can easily bring $20-25. Find a large slotted spoon or pastry cutter in very good condition and you can expect to sell it for $12-20 when the right customer comes along. Are Cookie Cutters Worth Anything? Cookie cutter fans try to find the most unique shapes and extra large or small sizes when they’re hunting and gathering. You can find all these useful tools in dozens of styles, colors and handle varieties. Cookie cutters range in price from $40-1,550 in many price guides. However, the exceptionally valuable examples date back a lot farther than most of those stashed around the average house. The older examples often date back to pre-1850 and have flat backs. Or, they're oddly shaped, like Abraham Lincoln or a moose with extra large antlers. Find a vintage spaceman cutter from the 1950s and you might get as much as $75-100 for it. Vintage Halloween examples shaped like witches and cats with arched backs can also be worth about $25 apiece, sometimes more for unusual designs. But most any tin cookie cutter holds some value, even it's just a few dollars. Examples with little painted wooden handles bring a little more money than those without, even in ordinary shapes like hearts or stars. Older copper cookie cutters are usually more valuable than similarly-shaped aluminum examples as well. Newer plastic cookie cutters are usually low rung when it comes to value unless they depict a very unusual subject matter and are no longer being marketed. Is it Safe to Use Old Kitchen Items? It is perfectly safe to use your vintage culinary items as long as they're not rusty and none of the paint on the handles flakes off into your food. Being quite durable, your favorite kitchen implements will likely be around for the next generation of collectors if you're not quite ready to put them to rest just yet. Simply hang on to those collectibles and continue to use them. There’s also something great about taking a gadget out of the drawer to use it and thinking about your grandmother, mom, or a favorite aunt if you're fortunate enough to have some of their kitchen tools. In this way, kitchen collectibles truly do stir memories and their special nature quickly transcends beyond mere age or novelty into that of a family heirloom.